Includes pulp container, juice jug, food pusher and cleaning brush. Parts are dishwasher safe. 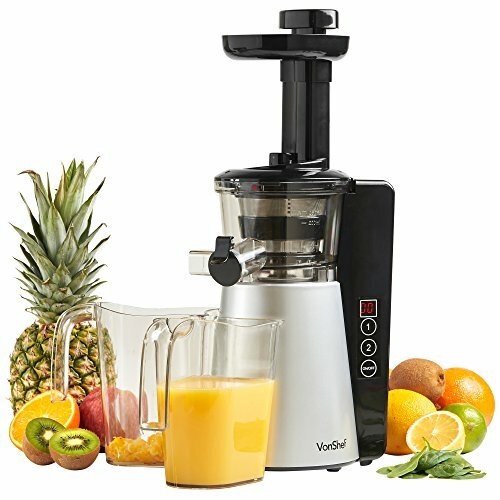 Enjoy tasty nutrient-rich juices with minimal waste with the VonShef Slow Juicer – it’s never been easier to get your 5 a day! Suitable for most kinds of fruits and vegetables, as well as nuts, beans and leafy vegetables like kale and spinach. The science behind the slow juicer is simple. Using a low speed cold press extraction method, the juicer processes and extracts at slow speeds to retain nutrients, vitamins and minerals. Compared to standard centrifugal juicing, ingredients are processed more thoroughly and produce a higher yield, drier pulp, less wastage and nutritious juice which stays fresher for longer. Thanks to its slow speed, the juicer is incredibly quiet, so you can juice to your heart’s content without worrying about disturbing the rest of the household. Powerful yet energy-efficient 150W motor juices high fiber fruit and veg with ease and without overheating. Easy to use with control panel, digital display screen, 2 speed settings and reverse function. Includes transparent pulp container, transparent juice jug and food pusher. Easy clean – just pour water through the juicer to clean without disassembling. Sleek, stylish and contemporary design in silver/ black. Size: 13.1 x 7.6 x 13.5 inches (approx. ).